that he sometimes worked for a florist located in the same shopping center. I found a lady working there, but she spoke no English and couldn’t answer my questions. Bummer! Dejected, I turned around to leave. Suddenly, I saw something move across the street. I looked again, and couldn’t believe my eyes. Dave — waving at me! In a city with hundreds of thousands of people, what are the chances of being on the right street, at the right time? After making his way across the street, we embraced. Long story short, Dave lost his belongings, and with them, my phone number. The city has cleaned out his spot a number of times, and unfortunate side-effect of his situation. If you are reading this you already know me, so I’ll spare you the details of introduction. I am in a foul mood! This has been a rough, lonely week. My makeshift shelter was ransacked and cleared out by the city recently. I lost all my meager possessions but that is far from the worst effect the sacking has caused. I lived with two other homeless gentlemen. They are brothers. Very reliable and trustworthy for “street people” (like me). Most of all though they are my friends and it is simply much safer and comfortable — as far as that can be — on the streets as a group. I have been alone since the event. My safety net and comfort zone has disappeared. Therefore my mood and sleep have suffered greatly. My patience has also been tried. As you know and for many of you I have this to thank, I am waiting for my ID to come in the mail. I want it NOW! After over a year out here knowing the end is near has me restless waiting on the DMV and US Postal Service. Then my perspective changes to gratitude and awe for all the strangers that have given a despairing man a world of hope and a renewed love for humanity I had almost completely lost. The love, prayers, and support shown me since my meeting Dave and through him, allowing God into my life and wonderful even if sometimes overwhelming and incomprehensible. Thank you all so very much for giving my heart and soul a light to see with. God is great. So are you. Amazing. I love you all. Thank you. He asked that I post this for you to read. He still has hope! This is where the florist is. I almost gave up, but it’s from right here that I noticed someone waving at me front across the street! Thank you, Dave, for helping this man, and for shedding a light on the life of homeless people like him. Thank you, Dave, for helping this man, and for shedding a light on the life of homeless people, like him. The hardest part of this type of ministry is when “they” disappear…the greatest part is when they resurface. Thanks for the reminder, Chris! Ha! I have him in my cell phone as “Dave of Santa Ana” since you gave me his number, Dave. Sounds regal, doesn’t it? (I didn’t know his last name or if he wanted to share it.) But yeah, words are powerful. Learned that especially from Melissa D. Have a great Easter, Dave!!! 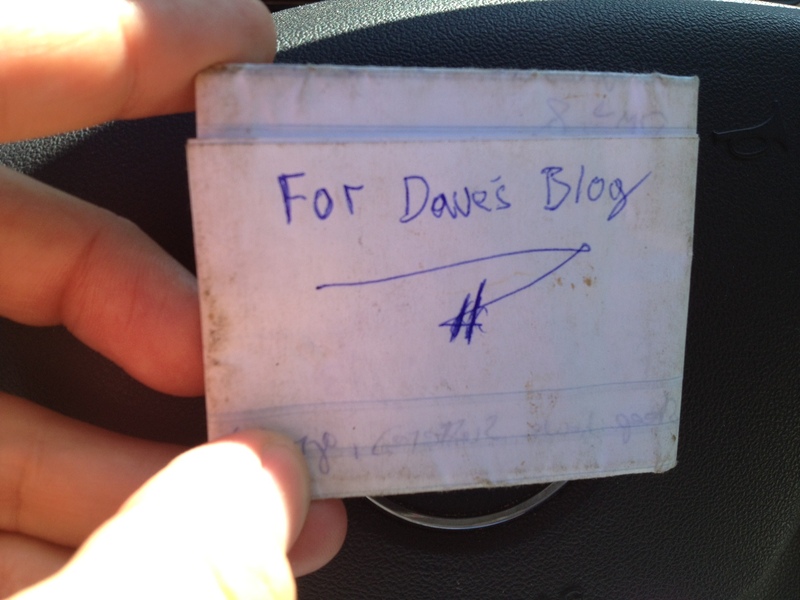 Dave, I just finished reading all of the blog posts describing your recent experiences with Dave. Thank you, not only for what you are doing to be a practical blessing to him, but more importantly, thanks for sharing your experiences with the rest of us! I don’t recall exactly how I stumbled upon the link to your blog earlier this evening, but I’m thankful I did, as your story is both encouraging and inspiring. Having talked with you on a number of occasions over the past year, I wish I had known about this earlier, so that I could have been involved from the start. But, you can count me in moving forward though… certainly as a partner in prayer, but also if there are other pressing needs. You have my contact info, so let me know! Thank you so much for the encouragement, and for stopping by and reading Dave’s story. It has touched a lot of people, and continues to be something that my heart is stirred towards. I will definitely keep you in mind moving forward. I intend to do more with the homeless community, and will certainly stay involved in Dave’s life to the extent practical. Hope to speak (or see) you again soon.